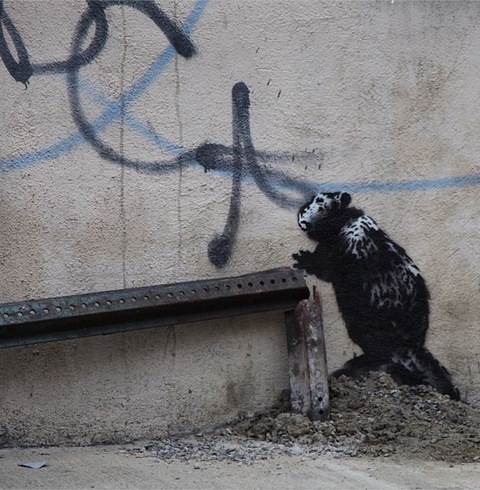 After a month-long residency on the streets of New York City, the anonymous street artist known only as Banksy has finished his tear upon the town. His final installation is an inflatable blow-up of Banksy’ name in the neighborhood of Queens, resembling the popular graffiti bubble letters. He signs off his blog with “Save 5pointz,” an iconic outdoor exhibit space for graffiti, which may be torn down soon. 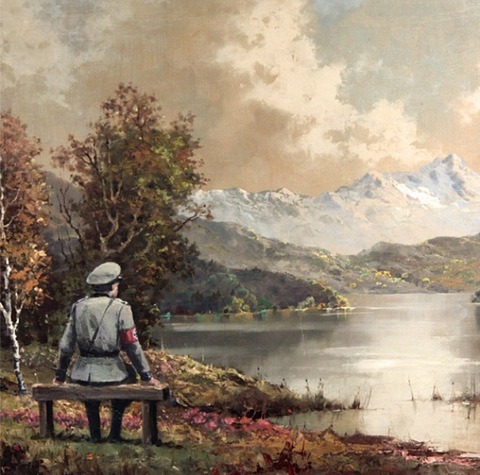 Oct. 29: The artist surprised one thrift store when he bought a work of art for $50, added a Nazi soldier and his signature to the painting and donated it back to the shop. The store, Housing Works, offers support to homeless patients living with HIV/AIDS. They quickly put the revamped piece up for auction to raise money for charity. As of Thursday morning, the painting has bids over $310,000. Oct. 14 Banksy fooled everyone, yet again, when he set up a booth outside of Central Park on Fifth Ave., and had a salesman sell his artwork for $60. In the course of the day, only $420 worth of his work was sold (note that Banksy’s pieces have sold for thousands in the past). Oct. 11: Passerbys were intrigued and frightened by Banksy’s installation on wheels “Sirens of the Lamb,” a “slaughterhouse delivery truck touring the meatpacking district” for the next two weeks. Oct. 10: A beaver at the base of a fallen sign was so small that some New Yorkers capitalized on it, covering it up with cardboard and charging “admission” to people if they wanted to view it. 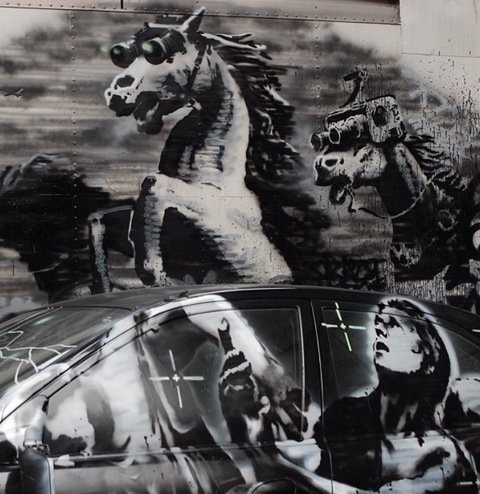 Oct. 9: Banksy proved that he’s all too familiar with the phrase, “one person’s trash is another person’s treasure” when he turned an abandoned car in a trash ridden alley into a stunning piece of art. Oct. 6: The artist released a staged video, complete with special effects, of a “Rebel Rocket Attack.” The “rocket” ends up knocking out Dumbo, the flying elephant, which many guessed was a reference to the Brooklyn neighborhood of the same name. 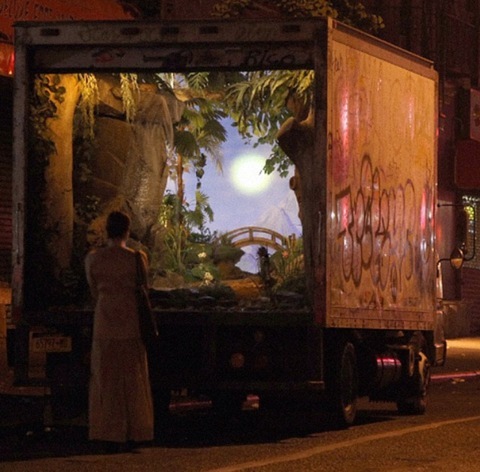 Oct. 5: Prior to his Dumbo attack, Bansky took a more peaceful route and transformed a delivery truck into a “mobile waterfall.” According to the audio recording on his website, the “delivery truck delivering calm” will make daily stops at dawn. 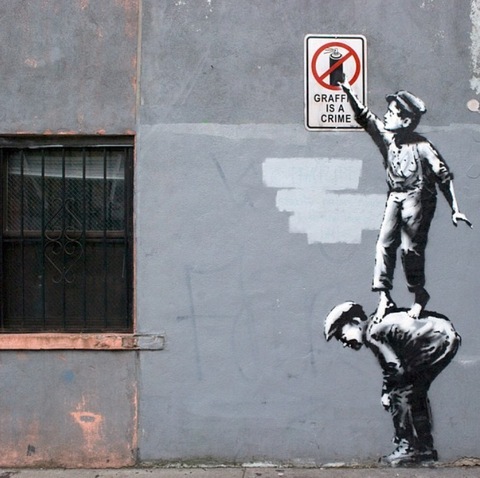 Oct. 1: Banksy announced his New York streets residency via a New York based Twitter and Instagram account connected to a website. Thirty-one days later, his art tour came to a close.